The Nigerian equities market on Tuesday closed in red as the All Share Index decline further by 0.14% to close at 31,082.32 points against the previous close of 31,125.39 points on Monday. 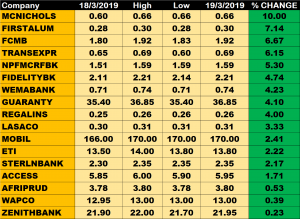 Market capitalisation closed lower by 0.14% to settle at N11.591 trillion against the previous close of N11.607 trillion, thereby shedding N16 billion. Aggregate volume and value of traded stocks closed at 286.9 million units and N3.09 billion respectively. 17 stocks closed positive while 18 stocks lost, bringing the market breadth to a negative round off. MCNICHOLS with 10% growth led other gainers, closing at N0.66 from the previous close N0.60. This is followed by First Aluminium Nigeria Plc and FCMB gaining 7.14% and 6.67% respectively among other gainers. Presco Plc tops the decliners’ list, shedding 9.33% of its share price to close at N68 from the previous close of N75. 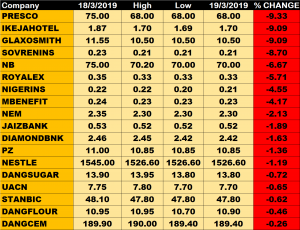 Ikeja Hotel and Glaxo Smithkline Consumer Nigeria Plc both shed 9.09% of their share price; while Sovereign Trust Insurance and Nigerian Breweries also shed 8.70% and 6.67% respectively. Access Bank traded about 84.67 million units of its shares 712 deals, valued at N500 million. UBA traded about 40.9 million units of its shares 380deals, valued at N307.9 million.